Early kaldorei civilization was defined by direct manipulation of magic drawn from the Well of Eternity to create and sustain their society. The constant use of the well attracted attention from Sargeras and the Burning Legion, and their coming resulted in a massive war known as the War of the Ancients. The war had grave consequences, for even though the combined might of Azeroth's mortal races were victorious, the continent of Kalimdor was shattered, and a swirling, raging miasma of sea storms flowed into the vacant area where the Well of Eternity used to reside. This Great Sundering caused the Well's waters to be permeated into the atmosphere and spread magic all over the world. 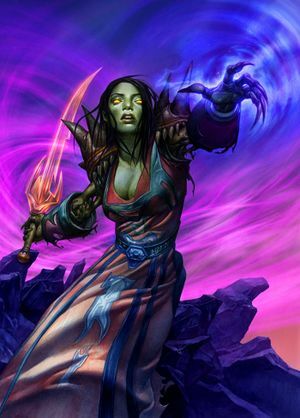 This event convinced the majority of night elves to reject arcane magic and embrace Malfurion Stormrage's call for druidism. Many of the Highborne refused this lifestyle, and left in self-imposed exile to Lordaeron where they eventually founded their kingdom of Quel'Thalas and became the high elves. When their kingdom came under siege by the trolls of Zul'Aman the high elves agreed to teach one hundred humans the arts of magic in exchange for military aid from the human nation of Arathor. From these two races, the arcane arts have spread to various races all over Azeroth. 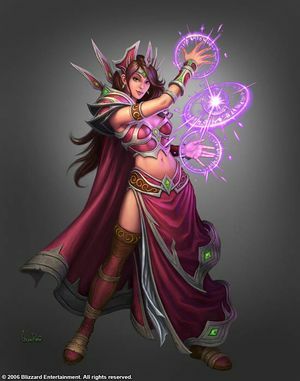 Once students of the Conjurers of Azeroth, this new order of mages had been forced to discover untapped magical forces to command in their war against the ruthless orcs. Although masters of their arts, the Conjurers who fell during the First War were unprepared for the rigors of warfare. Determined to avoid a similar fate, the mages began to undertake a regimen equally demanding on body and soul, thus dedicating themselves to the command of more aggressive and destructive magic. Whether in their sanctum at the Violet Citadel in Dalaran or on the many battlefields of Lordaeron, the mages are resolute in their efforts to defend the people. 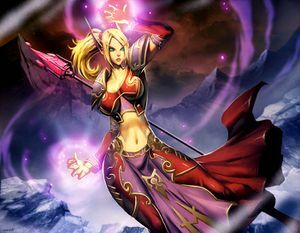 The most powerful mages of the Eastern Kingdoms were perhaps the Archmagi of Dalaran. The city was transported to Northrend when the mages believed they were in danger. It now hovers in the skies over Crystalsong forest and is ruled by the Kirin Tor. 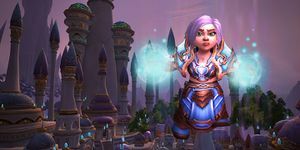 The Kirin Tor are quick to recognize fellow mages as allies where outsiders must do more to prove themselves. Heroic Presence is one of the most important mage beneficial racial abilities for PvE encounters as it increases the spell hit by 1%. Gift of the Naaru is a minor heal. Stoneform is a minor defence trait which can be used in PvP and PvE. Expansive Mind is one of the most important mage beneficial racial abilities as it increases mana by 5%. Note that it increases mana pool but not Intellect, spell power or spell critical. Escape Artist removes snares and speed reduction effects. Usable to PvP and certain PvE encounters. (Note: does not remove stun effects). Diplomacy grants a 10% extra reputation gains for every faction. Quickness mainly useful in PvP, gives a slight advantage over receiving damage. Shadowmeld acts as a minor and temporary focus distraction from PvE encounters. However, the player is still vulnerable (in contrast with Ice Block), does not reduce threat (unlike Invisibility but it removes Combat status (similar to Vanish). Shadowmeld can also be used when an enemy is casting a spell on the mage, forcing the enemy to lose their target and acting as an interrupt. Darkflight enables the player to move faster. Usable in both PvP and PvE encounters. 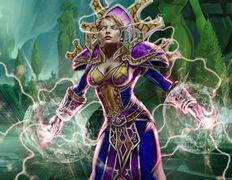 Arcane Torrent has similarities with Counterspell and restores a percentage of mana. Due to its limit in AoE range, it has limited use in Boss PvE encounters and is half effective on PvP. Arcane Acuity increases spell critical strike rate by 1%, therefore is handy in both PvP and PvE, especially considering higher possibility of an instant cast Pyroblast of the Fire specialization. Rocket Barrage as small damage ability. Rocket Jump similar to Blink for use in PvE and PvP. Time is Money is a slight reduction in casting time. Blood Fury gives an increase in spell power whenever activated. Hardiness a reduction in the total time of stun effects. Berserking has similar effects to Time Warp, has 10 seconds duration, 3 minutes cooldown but the most important is that unlike Bloodlust does not place a 10 minutes debuff thus making it an extremely beneficial racial ability. Regeneration (racial) is useful as an additional health regeneration effect, especially beneficial on long encounters. Da Voodoo Shuffle has use in both PvE and PvP. The mage is a pure DPS class, with all mage specializations focusing on dealing damage, and as such is capable of enviable damage output, whether launching an Ice Lance against a frozen target or invoking a Blizzard to decimate whole groups of opponents. However, mages also have an extremely diverse selection of crowd control and utility abilities, making them far more than just damage-dealers. From Spellsteal and Slow Fall to Ice Block and Mirror Image, mages have some fun and interesting spells at their disposal. Arcane spells include single-target damage spells and utility. 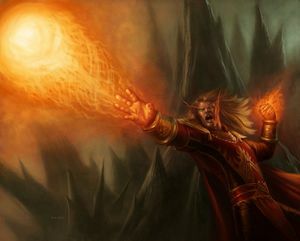 Arcane spells allow the mage to remove curses, provide crowd control, absorb damage, teleport himself or others to major capital cities, Slow Fall, Counterspell, buff players' spell power and mana pools, save mana for later use in the form of mana gems, conjure food for himself or others, and provide many other conveniences. 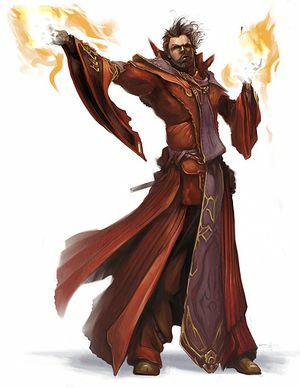 Mages' in-combat mana regeneration is provided by abilities such as Nether Attunement and Evocation, and the use of low-mana casting cycles (such as Scorch for fire mages or heavy use of Arcane Missiles for arcane mages). 参见：Mage sets A mage can only wear cloth armor. Arcane mages' damage focuses on Arcane Blast and Arcane Missiles. The Arcane specialization includes Slow, a powerful instant single-target slowing effect, and Arcane Barrage, an instant-damage ranged attack. 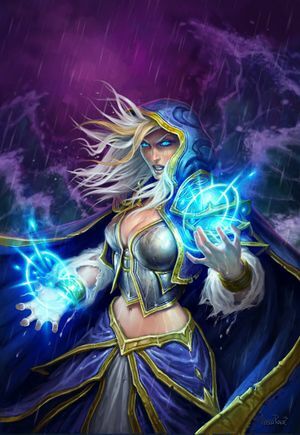 Arcane mages can provide substantial burst damage with Arcane Power and Presence of Mind. 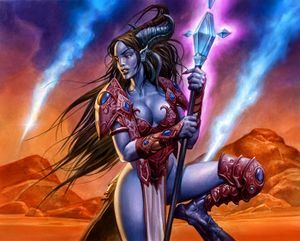 Leveling as an arcane mage was once very difficult, but with the signature arcane spells (Arcane Barrage, Arcane Missiles, and Arcane Blast) learned much earlier it is now a far more feasible leveling build. Fire mages' damage output is oriented around Pyroblast procs; whenever a Fire mage deals two critical strikes in a row, their next Pyroblast spell is instant. Fire is very strong in AoE where Combustion, Pyroblast, and Living Bomb can be spread via Inferno Blast. 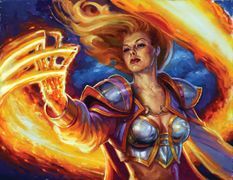 Fights in which players are forced to move frequently can also benefit Fire mages, as Scorch and instant Pyroblasts can fill the movement time which Arcane mages can only use Arcane Barrage. The Fire spec provides few survival tools. This has historically made Fire a good choice for high-end raiders who seek to maximize damage output, but poor in PvP due to Arena's survival requirements. Frost mages specialize in crowd control and snaring foes with their various chills, allowing for powerful kiting, and providing good AoE capability. Frost mages also learn Summon Water Elemental, gaining a pet which has a Freeze ability similar to Frost Nova. Frost's AoE makes it the spec best suited to five-player dungeons. 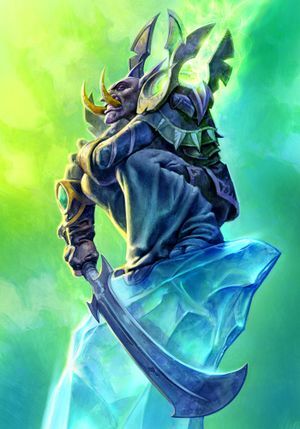 Frost is most effective in PvP, as Frost mages learn Deep Freeze to supplement their snare effects with a stun. In a group or raid environment, mages are usually tasked with ranged DPS, AoE, Counterspell, Spellsteal, crowd control and finally providing food. With the introduction of patch 1.11, mages enjoyed a high degree of flexibility in the endgame. Previous to patch 1.11, it was expected that most mages would spend at least 11 talent points in the arcane tree for Evocation, as it is a quite powerful mana-regenerative spell. It was given free without the use of talent points. New changes to all three trees also made investing points into both the fire and the frost trees much more viable. This still holds true with the release of Burning Crusade. It should be mentioned that a build predominantly using the fire tree will usually contribute greater DPS in multiple-target encounters; those using a predominantly arcane tree will usually contribute greater DPS in single-target encounters; and finally, those using a predominantly frost tree will contribute a fair amount of control. The endgame mage also acts as a utility class, providing drink, food, buffs and portals. Originally, when it came to providing drink and food, mages were by some considered equal to "vending machines" due to their unique ability to create food and drink and provide them with no cost except mana and time. In Wrath of the Lich King, Refreshment Tables may also be created at level 80 at the cost of five Arcane Powder; the table lasts for three minutes or 50 charges of Conjured Mana Strudel, whichever comes first. It is expected that a mage provides his party or raid with food and drink for free. A second (or third) table can sometimes be called for while mustering players at the beginning of a raid if the first expires before everyone has received their strudel. PvP-wise, mages are considered "glass cannons" - a design philosophy which gives mages generous burst damage at the cost of generally low health and armor values. 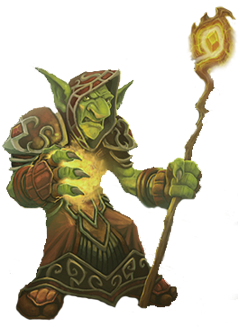 Aided by talents such as Presence of Mind and Arcane Power, they are one of the classes with the potential for dealing out the greatest amount of damage in the shortest amount of time. In group PvP, mages will stay back and focus on crowd control with Polymorph and pick off targets from range. Depending on the Battleground and the situation, mages typically AoE to prevent node captures or nuke flag carriers as fast as possible. In solo PvP, a skilled frost mage is a formidable opponent. Fire mages are in PVP well known for their burst damage, and arcane mages are known as venerable supporters. The Wrath of the Lich King faction of Dalaran, the Kirin Tor, start with a neutral reputation standing with all other classes. 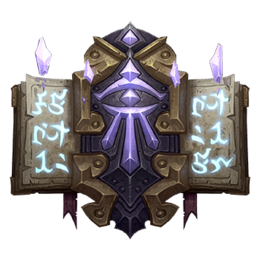 Mages, however, are automatically friendly with the Kirin Tor, making it possible to purchase and wear the Tabard of the Kirin Tor at level 1. 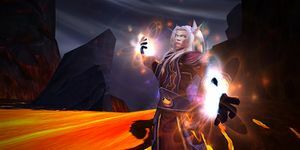 However, reputation cannot be gained in non-level 80 dungeons.